Saturday, February 9th. Tickets on sale now! 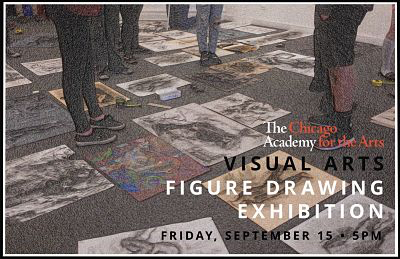 The first Visual Arts Department event of the year. RSVP for the 2018 Alumni Party! Visit the Gala website for more information. Click here! Students discuss how the exhibition has grown throughout the semester. Visual Arts Exhibition Opening - "Buildings and Blind Spots"
Exhibition opening on November 3rd. Artist Talk on November 29th. Friday at 4:45pm, Friday at 7pm, and Saturday at 7pm. Students present their figure drawing pieces in the first event of the year in Visual Arts. Please RSVP below! The second annual Summer Alumni Party. Thursday, August 10th at The Academy! Friday, April 28th at The Academy. Reception begins at 5PM! Visual Arts seniors present top work from their final year at The Academy. February 16th at The Athenaeum Theatre. Tickets available now! Opening Reception on February 3rd at 5PM! Poster by Audrey Landgren (Class of '18). Visual Arts students take direction from Academy alumni for this exhibition. October 28th at The Academy. Each year the West Town neighborhood of Chicago organizes a weekend art exhibition with the businesses and organizations along Chicago Avenue. Stop by The Academy to catch up with students and faculty and see student work!